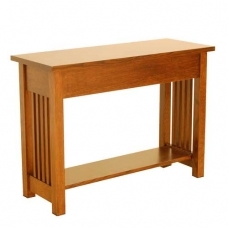 Our American Mission Entryway or Console Table is a very unique item. We have seen it used in an Office, a Foyer, a Hallway and as an End Table. You Decide! Made in the USA & features Quartersawn Oak and the classic Spindle sides with Korbels inspired by the original Arts & Crafts movement. and a Bottom Shelf .